In the last couple weeks, Fox News host Tucker Carlson has repeatedly pushed conspiracy theories about the Mandalay Bay mass shooting that left 58 people dead and over 500 more wounded, including about a security guard who was injured. Carlson stepped it up and began floating full-fledged conspiracy theories about the security guard, Jesus Campos, on October 17. Carlson claimed on his show that “Campos may have used someone else’s federal ID” to work at the Mandalay Bay. That claim too was corrected; the hotel sent a statement to Carlson’s show reporting that it had verified Campos’ status in 2015. Carlson is certainly not the only one pushing conspiracy theories about Campos and about the shooting. Fake news purveyors and online message boards have been active on the subject, and noted conspiracy theorist Alex Jones spent the week after the shooting recklessly accusing a multitude of people and groups of involvement, while also claiming that the whole thing might have been staged. And right-wing radio host Mark Levin promoted an article on Facebook and Twitter suggesting that Campos was involved in the shooting -- only to later delete his posts when he realized the article was from a fake news purveyor pretending to be CNN. But Carlson is the only one who hosts Fox News’ 8 pm prime-time show. And, as victims continue to recover from their physical, mental, and emotional wounds, the spread of baseless speculation and conspiracy theories not only has the potential to re-traumatize those victims; it has led to some, like Jesus Campos, being smeared and even receiving death threats. Fox News host Sean Hannity blasted the media for questioning President Donald Trump’s fitness for office as some outlets are discussing the president’s mental health. During the 2016 presidential campaign, however, Hannity repeatedly pushed conspiracy theories about Hillary Clinton's health and attempted to diagnose her with a slew of medical conditions. SEAN HANNITY (HOST): The destroy-Trump media, they are continuing their meltdown over President Trump. They are now pushing a new conspiracy theory about our commander in chief. They want you to think he's crazy. Let's see media, pot, kettle. Now, since the biased press wants to pretend to be psychology experts, well, we’re going to beat them at their own game. We will diagnose all of these overpaid, out-of-touch, lazy leftist ideologues that are suffering from Trump-derangement syndrome. Plus we'll continue to do the job the media should be doing. And that's telling you the truth about the Trump presidency. You will get this nowhere else on cable. Tonight's opening monologue. All right, so the conspiracy theorists over at CNN, MSNBC, mainstream media, they’re at it again. Now after failed attempts to smear President Trump with cries of Russia, Russia, Russia, Russia, Russia, after claiming the president is about to start a nuclear war with North Korea, and after falsely painting the president, conservatives, Republicans as racist, racist, racist bigots, well, now, the leftist hacks have created a fake news new talking point that they want to spread around in their new echo chamber. Now members of the media elite, they know it all. And media are now pretending to be experts in psychiatry and psychology. And they have found a brand-new way to try to delegitimize and destroy President Donald Trump. They are now claiming he is unhinged. He's unfit to serve. During the 2016 presidential campaign, however, Hannity was one of the leading voices in right-wing media who regularly pushed unfounded allegations that Hillary Clinton suffered from a number of diseases and ailments that made her unfit for the presidency. Hannity devoted entire segments of his show to pushing the conspiracy theory that Clinton “could be experiencing a serious undiagnosed medical condition.” He also claimed Clinton had suffered a stroke and said she had Parkinson’s disease. 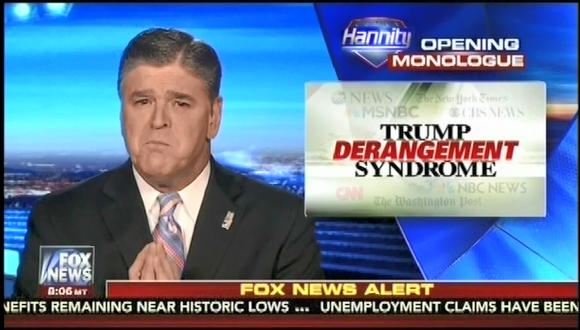 At one point, Hannity even invited medical doctors on his prime-time show in hopes they'd agree with his diagnosis that Clinton suffered from seizures. Those medical professionals, however, were unconvinced of his claims. Fox News’ Fox & Friends falsely claimed that Sweden’s reintroduction of the draft was due to violence in the country precipitated by refugees, when in fact the draft is being reintroduced to counter Russian aggression in the region. In September, non-NATO-member Sweden stationed permanent troops on the Baltic Sea island of Gotland. Defense Minister Peter Hultqvist described the move as sending a signal after Russia’s 2014 annexation of Crimea and its “increasing pressure” on the neighboring Baltic states of Estonia, Latvia and Lithuania. There have also been reports of airspace violations by Russia’s military aircraft in the Baltics and a military buildup in the Russian exclave of Kaliningrad, which sits across the Baltic Sea from Sweden. Since Trump’s statement claiming Muslim refugees have sparked violence in Sweden, Fox News has attempted to cover for his false claim by launching a campaign of misinformation which has included defending Trump by pushing anti-Muslim myths and using deceptive practices to fabricate claims that the Swedish government is downplaying refugee violence in the country. Host Bill O’Reilly was forced to admit on his show that he lied about a guest he claimed to be a “Swedish Defense advisor,” when in fact the man had no affiliation with the Swedish government, and didn’t even live in the country. Correction (11/2/18): This piece originally misidentified Fox anchor Heather Childers as Heather Nauert. MSNBC host Greta Van Susteren allowed Vice President Mike Pence to push the Trump administration’s budget proposals, including plans for new infrastructure spending, as he hypocritically condemned the Obama-era stimulus package for not including enough infrastructure money. In reality, Pence was one of the Republican congressional leaders who helped stymie new spending in the 2009 stimulus bill, which he continues to publicly condemn despite having secretly used funds provided by the bill to prop up Indiana’s economy during his tenure as governor. “I do support the state of Indiana’s efforts, over the last administration and this administration, to marshal those dollars and put them to work in ways that I think are going to help Northwest Indiana’s economy grow and really maintain our posture as the Crossroads of America,” Pence said. Pence also noted he is not the first Hoosier governor to blast stimulus spending on one hand, and grab for stimulus cash with the other. Former Gov. Mitch Daniels also condemned the stimulus. But the Republican had no qualms about taking some $1 billion in stimulus money that was intended to provide “extra” funds for Indiana schools, and instead using it to replace a regular state payment to school corporations. Van Susteren failed to challenge Pence on his hypocrisy, never mentioned that he voted against the stimulus, and didn’t even gain greater clarification on how the Trump administration’s supposed infrastructure agenda is a substantive improvement on President Obama’s. Conservative radio host Sean Hannity rightly defended President Donald Trump’s ten-year-old son, Barron, as off limits from attacks in the media by claiming that conservatives afforded President Obama’s daughters the same courtesy. But right-wing media had a field day attacking Sasha and Malia Obama throughout President Obama’s term, including Sean Hannity, who berated the Obama girls for going on Spring Break vacations. SEAN HANNITY(HOST): I will say one other thing. I did bring this up also last night. The way the media and these leftist snowflakes have treated this poor ten-year-old kid. Alright, I'm the only one that actually knows him. I met him, I shook his hand, I talked to him. The kid is a great kid. He's incredibly bright, smart, polite. You know, he's like a dream kid. "Hi Mr. Hannity, how are you? It's very nice to meet you. It's an honor to meet you." And I remember being blown away. Melania had to introduce me to Barron. He's such a good kid and I have these words for the media: leave the 10-year-old boy alone. Just like we conservatives left the Obama daughters alone. Leave the kids of politicians alone. Following President Obama urging Americans not to stigmatize patriotic Muslims, The Gateway Pundit’s Jim Hoft claimed “Lame-Duck Obama Defends Islam – Blames Americans for Feeding ‘Terrorist Narrative’” and included a photo of Obama wearing traditional Somali dress in his piece. If we stigmatize good, patriotic Muslims, that just feeds the terrorists’ narrative. It fuels the same false grievances that they use to motivate people to kill. If we act like this is a war between the United States and Islam, we're not just going to lose more Americans to terrorist attacks, but we’ll also lose sight of the very principles we claim to defend. Obama traveled to MacDill Air Force Base in Tampa, Florida this week to address the military for the last time. Obama defended his policies that resulted in the rise of the Islamic State. The lame-duck president also defended Islam and blamed Americans for feeding the terrorist narrative. The Gateway Pundit has been a go-to site for President-elect Donald Trump who has linked to the website 23 times on Twitter and used the information attack and smear President Obama. CORRECTION: This post originally stated that Hoft featured an image of Obama wearing traditional Muslim clothing at his brother's wedding. While Fox's Bill O'Reilly recently used such an image to smear Obama on the same grounds, the image Hoft highlighted showed Obama in traditional Somali garb during a 2006 trip to Kenya. Right Side Broadcasting Network’s (RSBN) announcement that they will be participating in White House press briefings is raising new questions about whether President-elect Donald Trump intends to bypass traditional media as President and create a press corps more favorable to his administration. Among other requirements, congressional reporters must demonstrate that they work for a publication whose "principal business is the daily dissemination of original news and opinion of interest to a broad segment of the public" and is "editorially independent of any institution, foundation or interest group that lobbies the federal government." The White House also requires an additional Secret Service background check. Trump could, however, circumvent press rules and procedures by allowing a non-credentialed reporter to ask questions during the briefings, which is exactly what happened in the last Republican administration. Jeff Gannon of the right-wing Talon News was “admitted on a day-to-day basis” into the White House briefing room where he was “repeatedly allowed to ask — usually friendly” questions to the Bush administration. It is unclear whether RSBN has applied or meet any of the standards set by the rules governing the press galleries, but their relationship with Trump makes their announcement problematic. Given Trump’s long adversarial relationship with the press, it appears he is taking this advice to heart and attempting to push out mainstream journalists in favor of reporters made in his own image. Fox News will air "OBJECTified: Donald Trump" on November 18, featuring TMZ's Harvey Levin interviewing the president-elect about his most prized possessions and the stories behind them. The special is poised to be another softball interview, contributing to the media's tendency to normalize Trump. The one-hour special, called “OBJECTified: Donald Trump”, will air Friday evening at 10 p.m. The special will feature an interview with President-elect Trump filmed in September, when he gave Levin a tour of his home and offered “stories behind each memento” there. In an interview on Fox News' Hannity previewing the special, host Sean Hannity praised Levin, saying that he wasn’t "playing gotcha [with Trump], you were asking real questions in a[n] intimate environment. He brought you in his inner sanctum, in a way, and it ended up giving us a side of Trump that I don't think most Americans know." But given Trump’s first steps as president-elect -- his appointment of former Breitbart News CEO Steven Bannon, who bragged about his site serving as a platform for the “alt-right”; his renewed vow to build a wall on the southern border of the country; and his pledge to create some sort of registry for Muslim immigrants -- it is clear Trump will push for the extreme policies he proposed during the campaign. Donald Trump has praised the interview on Twitter, saying it "features a side of me 'that has rarely been seen before.'" Per @FoxNews, the 1 hour special tonight by @HarveyLevinTMZ at 10 PM ET, 7 PM PT, features a side of me "that has rarely been seen before." An analysis by BuzzFeed News found that during the 2016 election, fake news stories generated more engagement on Facebook than did the top election articles from major news outlets. In the final three months of the US presidential campaign, the top-performing fake election news stories on Facebook generated more engagement than the top stories from major news outlets such as the New York Times, Washington Post, Huffington Post, NBC News, and others, a BuzzFeed News analysis has found. During these critical months of the campaign, 20 top-performing false election stories from hoax sites and hyperpartisan blogs generated 8,711,000 shares, reactions, and comments on Facebook. Within the same time period, the 20 best-performing election stories from 19 major news websites generated a total of 7,367,000 shares, reactions, and comments on Facebook. You’ve been writing fake news for a while now — you’re kind of like the OG Facebook news hoaxer. Well, I’d call it hoaxing or fake news. You’d call it parody or satire. How is that scene different now than it was three or five years ago? Why did something like your story about Obama invalidating the election results (almost 250,000 Facebook shares, as of this writing) go so viral? Honestly, people are definitely dumber. They just keep passing stuff around. Nobody fact-checks anything anymore — I mean, that’s how Trump got elected. He just said whatever he wanted, and people believed everything, and when the things he said turned out not to be true, people didn’t care because they’d already accepted it. It’s real scary. I’ve never seen anything like it. You mentioned Trump, and you’ve probably heard the argument, or the concern, that fake news somehow helped him get elected. What do you make of that? My sites were picked up by Trump supporters all the time. I think Trump is in the White House because of me. His followers don’t fact-check anything — they’ll post everything, believe anything. His campaign manager posted my story about a protester getting paid $3,500 as fact. Like, I made that up. I posted a fake ad on Craigslist. Why? I mean — why would you even write that? Just ’cause his supporters were under the belief that people were getting paid to protest at their rallies, and that’s just insane. I’ve gone to Trump protests — trust me, no one needs to get paid to protest Trump. I just wanted to make fun of that insane belief, but it took off. They actually believed it. I thought they’d fact-check it, and it’d make them look worse. I mean that’s how this always works: Someone posts something I write, then they find out it’s false, then they look like idiots. But Trump supporters — they just keep running with it! They never fact-check anything! Now he’s in the White House. Looking back, instead of hurting the campaign, I think I helped it. And that feels [bad]. The entire interview is worth reading. It’s clear now that Facebook must take concrete steps to combat fake news -- regardless of the conservative or liberal criticism the company might face. Join Media Matters in asking Mark Zuckerberg and Facebook to fix their fake news problem by signing our petition. Fox News will address an erroneous report claiming a Trump protestor engaged in voter fraud by using his grandmother’s address, who they claimed had been dead since 2002, after The Guardian debunked their report by talking to the grandmother who is still very much alive. On Wednesday Fox News will address an erroneous report aired on the show “Fox & Friends” earlier this week. Anchor Brian Kilmeade reported Monday that a man who disrupted a Donald Trump rally on Saturday had been engaged in voter fraud. “Democrats would love for you to believe that voter fraud does not exist, better chance for you to get hit by lightning, they say,” Kilmeade said. "This morning, yet another reminder from the guy who interrupted Donald Trump’s rally on Saturday, who many people thought had a gun." “His grandmother has been using his address to vote absentee for years. But she’s been dead since 2002,” Kilmeade said before bringing a former Department of Justice attorney to talk about voter fraud and how he doubted this case would be prosecuted. Austyn Crites, a Republican protester who was assaulted at a Trump rally in Nevada, was stunned to see a TV report on Monday associating him with fraudulent voting connected to a grandmother Fox News claimed died in 2002. However, the Guardian met Wilda Austin, 90, in her living room in suburban Reno late on Monday. She was alive and well, although somewhat baffled that she was having to prove her identity to correct a TV broadcast that reported that she died 14 years ago. “Please correct the record,” she said, arms crossed. Fox News has hyped voter fraud accusations for years despite studies finding voter fraud nearly nonexistent, even according to their own reports.